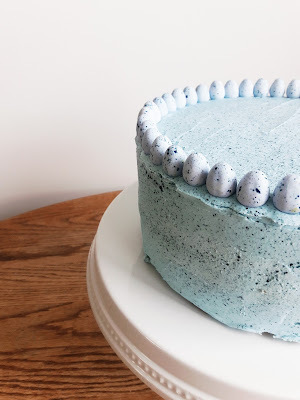 For the past few years I have been seeing these adorable speckled cakes all over. I decided to make it our Easter dessert for the year. Start with the cake of your choice. Nothing says spring to me more than a white cake and some fresh fruit. I made two eight inch round white cakes and placed whip cream and fresh strawberries in between. Feel free to use whatever flavor and size of cake you prefer. 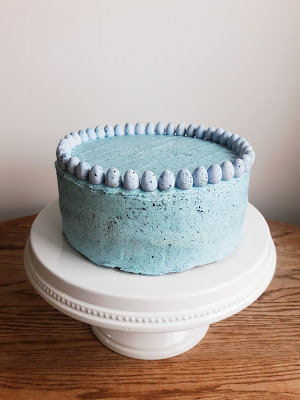 Once I had my cake stacked I dyed my buttercream frosting a light blue to match the blue Mini Cadbury Eggs. Any of the egg colors will work. Apply a thin layer of the buttercream frosting over the entire cake. Place the cake in the fridge for a half hour to let the crumb coat stiffen. 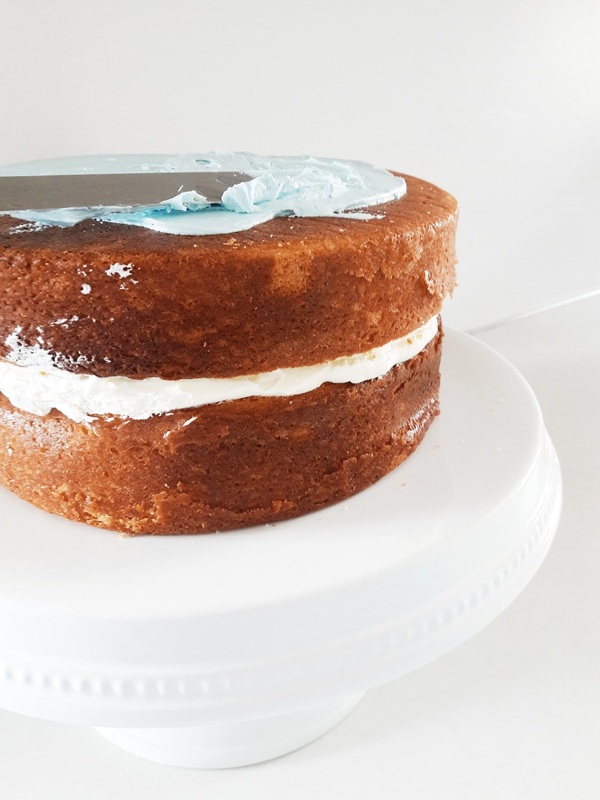 Once the frosting has stiffened apply another thin coat of the buttercream frosting and place it back into the fridge for an additional half hour to allow the second layer of frosting to stiffen as well. While the second layer is stiffening prepare your food coloring. I added blue food coloring to a bowl and mixed it with a little bit of water to dilute it. I used ten drops of food coloring and three drops of water. 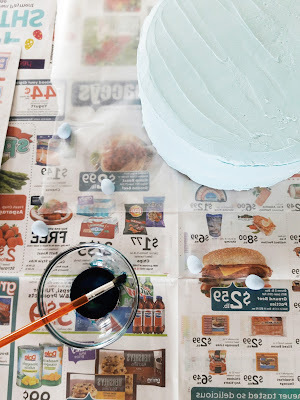 You don't want to dilute the food coloring too much or the drops will run on the cake instead of staying in place. I practiced splattering the food coloring on some extra frosting to get a feel for it and to see if the food coloring was to the consistency I wanted. Cover your workspace in newspaper, paper towels, whatever you have laying around to protect it from getting splattered. Once the second layer of frosting has stiffened remove from fridge and place on your covered work space. I added a piece of parchment paper under my cake so I could move it around without moving my newspaper and exposing my workspace. Using the paintbrush and your index finger, pull the paintbrush backwards with your finger and release it letting the paintbrush splatter the cake with the food coloring. Repeat until the cake has the coverage you want. To add some extra decoration to the cake I sorted the blue Mini Cadbury Eggs and added them around the edge on top of the cake. I then splattered the Cadbury Eggs with my food coloring mixture so they would match. Adding the eggs is optional. The cake looks so cute on its own! I absolutely love how the cake turned out! It is the perfect spring dessert. It's also the perfect way to use up any extra Cadbury Eggs you might have after Easter. What desserts to you enjoy on Easter?